Seriously simple baked pears drizzled with real maple syrup. We have enjoyed these just as they are but I’m sure they would be divine a la mode. My kids cannot get enough of these! Preheat oven to 400. Peel, slice and core pears. Place pears in a baking dish. Drizzle with maple syrup. Bake for 15 minutes. Turn pears over and cook for 15 minutes more or until pears are tender. 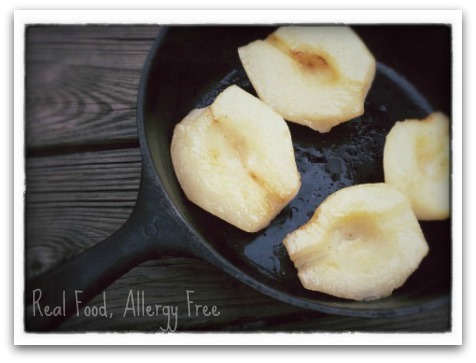 You may also enjoy Grilled Peaches and Dairy-Free Caramel Dip/Sauce for your apples. « Hurry! Free Zevia at Target! That’s funny Joy! I said something like that the other day and we all busted out laughing. Love it when our mind plays tricks on us. so simple and easy! would be great for breakfast!! over oatmeal!